Poet Chloe Honum: I expected the artist would pick up on the way emotional experience is intertwined with the natural world in the poem, which he certainly did, though in a much less obvious and more exciting way than I had imagined. Artist Bailey Bob Bailey: Two things really, family and rumination. I felt as if I were lying on my back in a wooded yard, in a kind of stasis of observation. A blurred clarity diffused through overlapping branches as my back cools on the cold wet ground. Poet Chloe Honum: Absolutely. 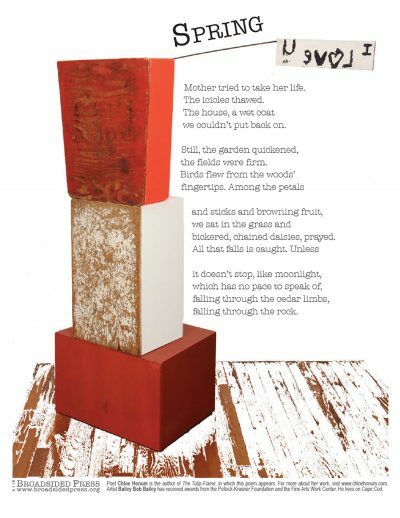 The visual art makes me see the poem as more robust and bold—in both meaning and structure—than I had seen it before. I’d seen it as more delicate, or “prettier.” Those wood blocks to me convey solidity, but they’re also stacked in a way that I can imagine toppling, so I feel a tension between what is sturdy and what is fragile. I’d been more attuned to the fragile, I see now, and it’s wonderful to better understand the poem’s allegiance to a kind of solidity. Artist Bailey Bob Bailey: The three panels on the front are all found. The boxes were fabricated to add a dimensionality. It felt like a sentinel figure. While I was building the piece I took an in-progress photo and in the background was this found sign, it was at that point I realized the sculpture had its own agenda. Poet Chloe Honum: The colors surprised me, especially the reds. The floorboards at the base also surprised me. That floor seems to bring the poem indoors, into the house perhaps that the sisters in the poem have fled. The “I love U” below the title surprised me, too (I guess the whole thing surprised me!). To me, that tag feels fraught with the urge to say something simple, and yet it’s backward and inky. I love that. Artist Bailey Bob Bailey: It just seems to make the piece more of a vessel, a reaction to this familial drama. The poem kind of filled the boxes. Poet Chloe Honum: The poem gave me a treasured connection to the painting. The last line of the poem is: “To love her is to accept that she will never turn around,” which refers to the dancer in the painting, but that acceptance is also true for me in some of the most intimate relationships of my life. Degas’ painting contains so much beauty, yet to me there’s also a kind of rejection in the way the dancer is turned away from the viewer. The painting allowed me into the space—and the colors—of that feeling. Artist Bailey Bob Bailey: I have always loved the formal qualities of great writers. The writer who invents new form is always the one I seem to champion. My best friends are poets. Making art is essentially poets’ work. Artist Bailey Bob Bailey: Perhaps Brian Eno’s “Music for Airports” or Angel Olsen’s “The Sky Opened Up”. Poet Chloe Honum: I’m currently reading two debut poetry collections, Phillip B. Williams’ Thief in the Interior and Richie Hofmann’s Second Empire, both of which are divine. Artist Bailey Bob Bailey: Nell Zink’s Mislaid. Poet Chloe Honum: A few years ago, I was lucky enough to spend a winter and spring at the Fine Arts Work Center in Provincetown, where my partner was a writing fellow, and while there I fell in love with the work of Golnar Adili (golnaradili.com), who was a visual arts fellow at the time. I’ve continued to follow her work, and it never fails to captivate and move me. I also love the artist who created the sculpture on the cover of my book. Her name is Karen LaMonte (karenlamonte.com), and I was blown away when I recently saw some of her pieces in person at Crystal Bridges Museum of American Art in Arkansas. Artist Bailey Bob Bailey: Funny as it is, I’ve been looking at Ron Gorchov paintings, a real unsung force. Poet Chloe Honum: My great thanks to all the Broadsided Press vectors! It’s very exciting to think of these collaborations being out in the world. Chloe Honum’s first collection, The Tulip-Flame(Cleveland State University, 2014) won Foreword Review’s Book of the Year Award and was a finalist for the PEN Center USA Literary Award. Chloe has received a Ruth Lilly Fellowship and a Pushcart Prize, and her poems have appeared or are forthcoming in The Paris Review, The Volta, Orion, and The Southern Review, among other journals. She was raised in Auckland, New Zealand. Find her online at www.chloehonum.com. “Spring” first appeared in Poetry Magazine. The poet and her collaboration at Looney Bean Coffee in Bend, Oregon. The artist takes his Vectorizing seriously: laminated and staple-gunned in Provincetown!